The National Development Planning Commission (NDPC) says the implementation of the Capitation Grant scheme has failed to eliminate extra fees and charges at the basic school level. The Capitation Grant Scheme was introduced by the Ministry of Education, Science and Sports (MOESS) in 2005 with the ultimate objective of abolishing all school levies which were hitherto, hindrances for most children who wanted access to basic education. But according to a citizens’ assessment report on the Capitation Grant scheme, about 75 percent of households in Ghana who have children in public basic schools pay some form of levies and charges. “Some of the levies being charged at the basic school level include examination fee, extra-classes fees, PTA levies, sports and culture, Computer (ICT) fees and utility bills among others,” the report stated. Speaking at the launch of the 2014 citizens’ assessment report on the capitation grant scheme in Accra recently, Minister of Education, Prof Jane Naana Opoku- Agyemang, stated that despite the challenges associated with the implementation of the scheme, it has increased gross enrollment from 83 percent in 2004 to 105 percent in 2014. Prof Opoku- Agyemang said one of the key challenges faced by the Capitation Grant was delays in the release of funds basically due to fiscal and economic conditions often unforeseen and unplanned. “The objective of the scheme was to remove the barriers posed by school fees but sometimes we get reports of children being sent home to bring such levies. I’m sure some of these things would be reduced if funds meant for the scheme are released on time,” she said. She urged the Ministry of Finance to release funds meant for the scheme on time to address the various challenges faced by public schools across the country. Dr. Kwesi Botchway, chairman for NDPC who launched the citizens’ assessment report on the Capitation Grant scheme said the report would help stakeholders learn about the pitfalls in the scheme and strengthen it to serve its purpose. “ It is therefore my hope that the findings contained in the 2014 Citizens’ Assessment Survey Report on the capitation grant, will help us learn more lessons aimed at strengthening its implementation and making the necessary adjustments to the scheme so that the benefit of the introduction of the initiative will be maximized,” he noted. 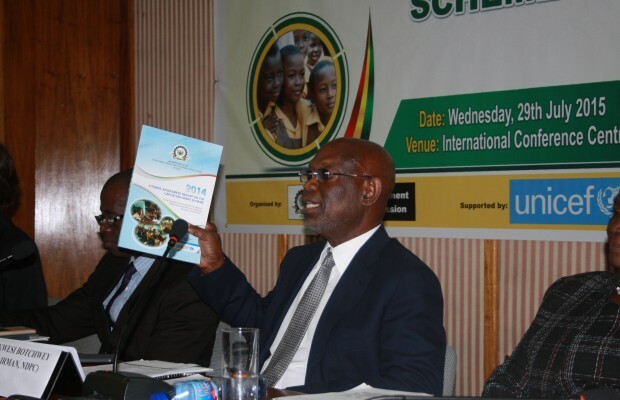 Under the Capitation Grant scheme which was introduced in 2009 and implemented across the country during the 2011/2012 academic year, public basic schools in Ghana were entitled to receive GHC 4.50 per pupil every academic year and the funds generated used principally for the day-to-day running of the school. The scheme entails the school feeding program, free textbooks and free uniforms among others.